It’s pickling time of year! I just want to remind you of a few things to get the best pickle. One, is the type of cucumber you are using to make pickles. 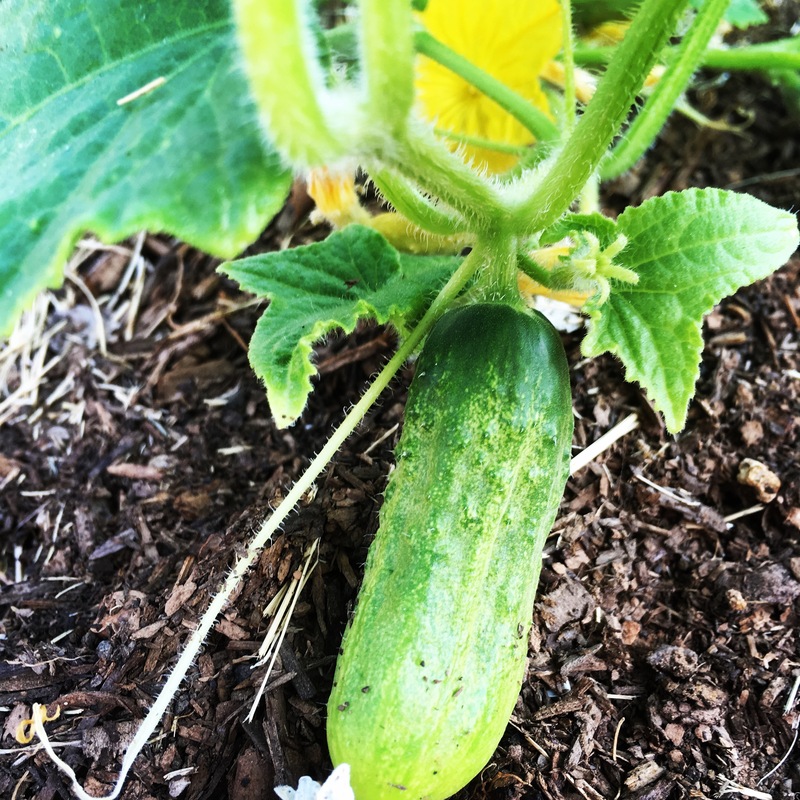 You need a pickling cucumber. The best ones are from the black spine type, with small black prickles, such as the Chicago Pickling Cucumber and National Pickle. Wash all ingredients carefully to remove bacteria, which might spoil your product. In washing cucumbers, DON’T scrub so that you remove the black prickles. A good way to get off the dirt and bacteria is to soak them for a few minutes in a glass or plastic container with a tablespoon of pickling salt and one tablespoon of vinegar. Rinse well in running water as you gently rub them. The pot you will be using to make the brine should never be brass, copper, iron or aluminum. Any of these will produce a strange taste and undesirable color changes because the metals will react with the vinegar and salt solutions. Use enameled ware, glass, or stainless steel. Stir with wood spoon and or stainless steel ladle. Whenever possible, use water without chlorine. Here is how you can use your water to eliminate chlorine and other minerals. Plan in advance and boil the water for 15 minutes. Let stand for 24 hours. When all the sediment has settled to the bottom, ladle the water from the top. Add 1 tablespoon of white vinegar with 5 % acidity to each gallon of water before using. Or buy bottled distilled water and add 1 tablespoon of vinegar to each gallon. You will never regret all this effort. Do not use table salt in pickling or canning. Table salt has iodine and anti-caking agent. That will turn pickles an undesirable color and soften the pickle. Use Pickling salt for best results. Vinegar should be 5 % acidity. Check the label for percentage of acid and also check the expiration date. If it is past the expiration date, use it to make salad dressing not pickles. Vinegars of unknown strength should not be used. Either cider or white vinegars may be used. When pickling light-colored foods such as onions, white vinegars is preferable for it will not darken the ingredients. When making a simple solution of vinegar, pickling salt, and water, do not boil more than 5 to 6 minutes unless otherwise directed in the recipes. Long boiling weakens vinegar. Follow the timings suggested in the recipes: if a recipe says bring just to boil, do that. Always use fresh spices and herbs. Old ones will discolor the product and produce musty, strange flavors. If a recipe calls for you to put spices in a spice bag ( cheesecloth tied with kitchen twine) make sure it is not too tight so the brine can flow through during the cooking time. Remove bag before canning. If you have access to fresh grape leaves, wash them and place on top of produce in the jar. This will keep the produce under the brine and help with keeping the produce crisp. Any recipe can be changed to fit individual taste in SPICES Only. Do not change the amount of vinegar, water or salt. 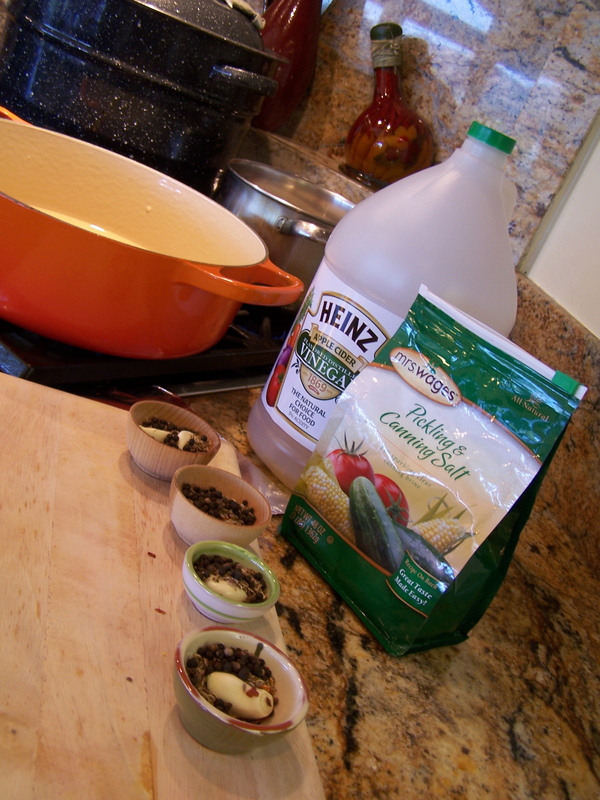 Blended pickling spices are available commercially, I like to blend my own. Here are a list of spices I like using: Allspice, Bay Leaf, Black Pepper Corns, Cardamom, Cayenne, Chili, Cinnamon Stick, Coriander Seeds, Clove, Dill Seeds, Ginger, Mustard Seeds, Nutmeg ( grated), Hot Red Pepper flakes, Turmeric, and Celery Seeds. Garlic is a wonderful addition to pickles. But one warning; If you wish to add garlic to a jar of dill pickles or any pickles, you will need to peel the cloves then plunge them into boiling water first for 1 minute. This blanching process kills the bacteria on garlic, which can cause spoilage. Or you can place the cloves in vinegar for about 1 to 2 minutes before filling the jars. I hope this helps you get the best pickle for you and your family. Making pickles is a lot of fun and quite easy. The hardest part is waiting just the right amount of time for them to pickle before you eat them. When pickling you need about a teaspoon of different spices for each jar. I like to line up little bowls and place the spices for each jar in the bowls. Then I place the produce (whatever I am pickling) in each jar, then the spices before I finally pour the hot brine in the jar. This kind of cooking organization makes things go fast. Choose good quality ingredients that are uniform in size, fresh and free of blemishes. “Misfits” can be used for relishes. Fruit may be use for pickling too. Using fruit that is not quite ripe is best. The ordinary cucumbers at stores are called “slicers” and are for table use, not for pickling. At some places you can find pickling cucumbers. The best ones have small black prickles on them. Chicago Pickling or National Pickling cucumbers are some common names for the type of cucumber that is best for pickling. Remember to wash all ingredients carefully to remove bacteria which might spoil your product. When washing cucumbers, don’t scrub them so hard that you remove the black prickles. A good way to get the dirt and bacteria off is to place the cucumbers in a clean big bowl with tablespoon of pickling salt and one tablespoon of white vinegar for a few minutes. Then, rinse them well under running water as you gently rub them. Never use brass, copper or aluminum pots, pans or utensils for pickling. Any of these materials will give your pickles a strange taste and an undesirable color because the metals will react with vinegar and salt solutions. Use enameled, glass or stainless steel cookware. Stir with a wooden spoon and use a stainless steel slotted spoon. Do not use table salt when pickling. The iodine in the table salt will darken the brine and soften the pickles. Use a good pickling salt. The vinegar should be no LESS than 5 % acidity; it will say right on the label. Vinegar of unknown strength should not be used. When making a simple solution of vinegar, salt and water, do not boil for more than 5 to 6 minutes unless otherwise directed in the recipe. A long boil weakens the strength of the vinegar. Always use fresh spices and herbs. Old ones will discolor the product and produce and also give them musty, strange flavors. Have fun pickling!